This tutorial will walk you through creating Office 365 Room and Equipment Mailboxes. It is critical that you follow the pre-requisites below as my Hybrid connection script is needed to run these Hybrid Management scripts successfully. At some point in your Hybrid administration, you will move on from creating local Exchange mailboxes that are later moved to Office 365, to now creating mailboxes directly in Office 365. The PowerShell process for this is to create a RemoteMailbox. This allows the full Hybrid experience for newly created Office 365 mailboxes. The basic process for creating all the various types of Office 365 mailboxes is very similar, apart from a few small differences (different cmdlets are used). In fact, if you compare the the powershell script cmdlets used in the creation of these objects, you will see the cmdlet changes. Only the Rooms and Equipment spreadsheet has the Booking Delegate and Resource Capacity columns as well as the Full Access, Send As and Send on Behalf. This is also the same for both Local Exchange and Office 365 mailboxes. To start creating Office 365 Room and Equipment Mailboxes, ensure you have already downloaded the following scripts and csv folders mentioned earlier in the pre-requisites section. Extract the folders in the Hybrid Office 365 Administration Pack zip file to the folder of your choice. Copy the appropriate ps1 and csv files to the root of c:\scripts. For simplification, we will review the process for the Room creation in the following steps. To create Equipment mailboxes, the process is exactly the same, only the script is different. Edit the RemoteRoomMailboxes.csv with your data. Although that is the minimum that is needed to actually create a mailbox, you would in normal practice use FirstName and LastName for ease of management. Things to be aware of when updating the spreadsheet for Room and Equipment mailboxes. - Enter the Alias of the Manager (this is usually the UPN without the domain name. Open PowerShell ISE and connect using my Hybrid Connection script - (see above). Once you have updated your csv, you can simply run the script by clicking the Play arrow. When the script runs, you will see that it has created the mailboxes. There will be a delay while the accounts are synchronised to Office 365 by Azure AD Connect. After Azure AD Connect runs, there is a five minute pause to ensure the accounts are fully provisioned. After this delay, the script will continue and apply delegate permissions. The screen will display the delegate permission changes. The script will then advise that the Remote Room Mailboxes have been created and synched to Office 365. Please note that I have not built error checking into my script, so it is important to confirm the mailboxes have created successfully. Log into the Office 365 - Exchange EAC and confirm the creation of the Room mailboxes. You can also confirm the successful setting of delegated permissions by checking the mailboxes. 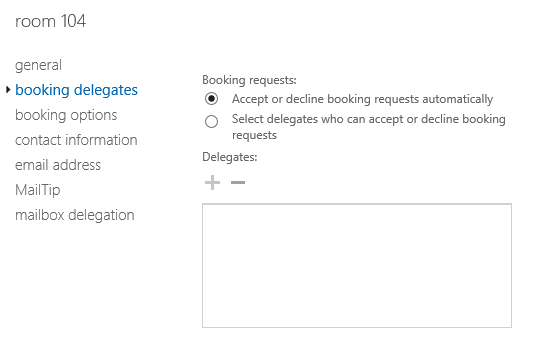 Now confirm the room or equipment is set to AutoAccept (if no Booking Delegate is assigned). - Note the setting - Accept or decline booking requests automatically. -- Also note, that a delegate appears because that user has Send On Behalf permission. Follow the exact same process for creating Equipment mailboxes.